There are nearly two dozen Grizzly band saw models for woodworking, ranging from an inexpensive 14" vertical bandsaw up to large industrial-duty horizontal bandsaw made for resawing only. Most hobbyists are only interested in the vertical bandsaw models, so that is what I will be covering on this website. I already reviewed the 14" Grizzly bandsaw models on another page, and I will be reviewing the 17" bandsaw models here. Grizzly has been selling woodworking tools and machinery since the 1980's, and over the last ten years or so has won a large number of happy customers. Their stationary woodworking tools have won numerous "Best Buy" and "Top Value" awards from different magazines, and many customers rave about the great service they get from Grizzly. A number of customers comment that their Grizzly band saw has the same quality and features as other band saws that cost considerably more money. One thing that makes a Grizzly band saw a great value is what is included with the machine. Many other band saws don't come with a fence or miter gauge; these items must be purchased separately. Every Grizzly band saw below comes with a fence and miter gauge at no extra charge, and several models even come with a 6" resaw attachment, too! I do want to note that in my Grizzly 17" bandsaw review, I will be ignoring customer complaints about the quality of the blade that is supplied with the saw. That is a very common complaint no matter what brand or type of woodworking bandsaw or table saw you look at. I expect that if you are considering one of these larger models, you plan on buying several different high-quality blades for different purposes anyway. The first of the "big" 17 inch band saw models is the Grizzly G0513 series. These have a 16-1/4" rip capacity and a 12-1/8" resaw capacity. All come with 2 HP 220V/110V motors, two-speed pulleys (1700-3500 FPM blade speed), and a quick-release blade tension lever. The G0513 series woodworking bandsaw models also have a blade tracking window, a blade tension indicator, a height scale measurement on the blade guide, a 1" max blade width, and two dust ports. The cast iron table tilts on a micro-adjusting geared mechanism, and the blade guide has a rack and pinion height adjustment. There are four different band saws in this series. The G0513 Grizzly band saw has a 17" x 17" table, with Euro-style roller disc blade guides, cast aluminum wheels, and an extruded aluminum fence. The G0513P "Polar Bear" model is identical except it is solid white. The G0513X2 model (pictured) comes with a larger 23-5/8" x 17-1/4" table, plus upgraded cast iron wheels, a cast iron trunnion, a cast iron fence with an aluminum resaw attachment, and ball bearing blade guides. The G0513X2B has the same upgrades, but adds an electronic motor brake that stops the blade in about 3 seconds after turning the saw off. The Grizzly G0513 band saw won the WOOD Magazine "Top Value Award" in 2005. Fine Woodworking Magazine also gave the G0513X2B their "Best Value Award" in 2010. There are several G0513 series Grizzly bandsaw reviews online from individual owners, and everyone I could find who wrote a review is happy with it. 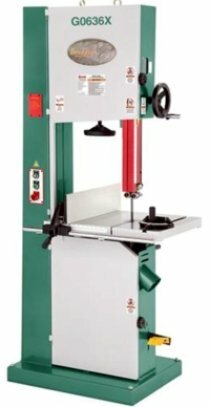 On the Woodworking-Online.com forum, an owner of the G0513 said, "...I love the features, and especially ease of adjustment, including height adjustment... This is a great tool for the price." An owner of a G0513X (earlier version of the G0513X2) on WoodworksLive.com praised the "incredibly smooth rack and pinion height adjustment", and said the saw is very smooth and quiet. He said the motor has plenty of power, and he is very happy with his purchase. In closing, he said, "... Lotta value there for that amount of money in this day and age, folks. I'd recommend this saw to anyone in need of a little larger bandsaw." An owner of the G0513X2 Grizzly band saw on NewToolReviews.com said, "...From rounding timber to be used as bowl blanks for turning, to intricate cuts involving smaller blades and a high level of attention, the bandsaw has performed well. Right out of the shipping crate it seemed well tuned. Minor tweaks were needed for blade alignment (as could be expected), but other than that it was ready to cut (minor assembly required to attach table and such)... Overall, this bandsaw is great. It's hard to find a flaw. The oversized table, cast wheels, quality guide system, and powerful motor are all well made and solid. Grizzly has done a great job with this machine... especially considering the bang for the buck." On the LumberJocks forum, there are eight different G0513X2 Grizzly bandsaw reviews, averaging 4.6 out of 5 stars. One owner said, "I have owned many bandsaws, and this is the only bandsaw that has ever met my expectations." Several other owners echoed the same statement, that this is a great piece of machinery that does what a woodworking bandsaw is supposed to do. The owner that gave it the lowest rating received the saw with a broken part, but once he got the replacement part and got it running, he said, "...I have done resawing with it and it handles everything I throw at it! I recommend this saw." The Grizzly G0513 series compares favorably to the 16" and 18" Jet band saws reviewed here. The Grizzly has similar capacities and features, gets better reviews, and costs hundreds less. Note: If you are considering getting your first band saw, or need help tuning up one you already have, I recommend getting a copy of either (or both!) Lonnie Bird's The Bandsaw Book or Mark Duginske's The New Complete Guide to the Band Saw . Either of these books will help you to understand the features that are available on different band saws, and guide you through choosing the right types of blades, adjusting and maintaining your saw, and what to do when things go wrong. Both have terrific ratings on Amazon, and are recommended by lots of folks in the woodworking forums. The other series of 17 inch Grizzly band saw models are the Grizzly G0636X and G0636XB. These are considerably more expensive woodworking bandsaws than the G0513 series, and they are designed to compete with high-end European models. They come with a big 5 HP 220V motor, and have a 16-1/2" rip capacity and a huge 16" resaw capacity. The table measures 25-1/2" x 21", and tilts on a micro-adjusting rack and pinion. Blade speed is 4500 FPM. The ball bearing blade guide height is adjusted with a rack and pinion mechanism (with height scale measurement), and they both have a quick release blade tension lever, a blade tracking window, blade tension indicator, and 2 dust ports. They have lots of heavy-duty cast iron parts, including the wheels, trunnion, and fence. They also come with the 6" tall aluminum resaw fence attachment. Both of these Grizzly band saws have blade brakes, but the difference is in how they operate. The G0636X (click for more info) has a foot brake to stop the saw blade quickly when you want it to, and the G0636XB has a motor brake that automatically stops the blade in about 3 seconds after you turn the saw off. There aren't a ton of reviews for these Grizzly 17" bandsaw models, but I found a few. First, the G0636XB won Popular Woodworking Magazine's "Best New Tool Award" in 2009. I also found an owner on the WoodworkingTalk.com forum who said, "I bought one when they first came out and I cannot say enough good about it... It is a tank, lots of steel, I am very happy with my purchase. I also bought several other Grizzly tools since... Great tools for the money". A different owner on the Sawmill Creek forum says that, "...It has done everything I have asked it to do. It resaws just fine and with a small blade is very smooth." Overall, the 17" Grizzly band saws offer great quality at an exceptional price. The G0513 series 17" bandsaw pricing is actually in line with some of the smaller 14" woodworking bandsaw models from several other manufacturers. If you compare these band saws to similar offerings in other brands, they are hundreds less. The G0636 band saws are in a different class than the G0513 saws, but are priced several hundred less than other woodworking bandsaw brands with similar resaw capacity, features and power. You can get detailed specs on all of the Grizzly band saw models at Grizzly.com. Grizzly's owner, Shiraz Balolia, is active in several online forums and has answered many questions about the different Grizzly band saw models, even posting photos he took to answer people's questions. It is refreshing to see the owner of a large company getting involved with his customers like that. The 17" Grizzly band saw models should be near the top of your list if you need something just a bit bigger than a 14" bandsaw. 17" still not big enough? Grizzly has several 19" models that also get good reviews and are a terrific value, and there is even a 24" monster. Whatever size you are looking for, a Grizzly band saw is a good machine for a great price.